The Gaston County Family YMCA has made a commitment to children and youth by adopting the Healthy Eating and Physical Activity (HEPA) standards. These are the goals for nutrition and physical activity in our Afterschool programs,Summer Camps and other kids programs. Click the above image to enlarge. Provide all children with at least 30 minutes of moderate to vigorous physical activity every day. The program insures that all afterschool child care participants get a minimum of 30 minutes of physical activity a day and take advantage of outdoor activities weather permitting. Free activity, tummy time for infants is scheduled every day. Outdoor play for infants may include a carriage or stroller ride. Offer 20 minutes of vigorous physical activity 3 times per week. Do not serve sugary drinks and do not allow sugary drinks to be brought in during program time. All sugar sweetened beverages, such as sodas, juices, or energy drinks are not allowed to be consumed at the Y program site. Milk is always unflavored and 1% for children over 2 years of age. Infant feeding. We support breast feeding and welcome breastfeeding mothers. If you would like to breastfeed in the center, we will ensure that you have a comfortable and private area in which to feed your child. Offer water as a drink every day. Water is available at all times during program hours. Offer a fruit or vegetable at every meal and snack. Fruits can be fresh, frozen, canned or dried, without any added salt or sweetener. Do not serve foods with trans-fat. We ask all parents to refrain from packing fried foods, and foods high in sugar and saturated fats, such as chips, cookies, gummies, fried chicken nuggets, etc. Meals are served family style. Teaching children to pass food will help enhance self-help skills along with social skills. Computer and digital device time is limited to homework and instructional use only. 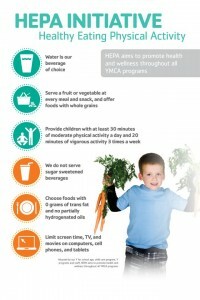 We encourage parents to have their children participate in our food program. Our Y will provide family/parent engagement activities at least once per quarter during the year that include a physical activity and healthy eating component. 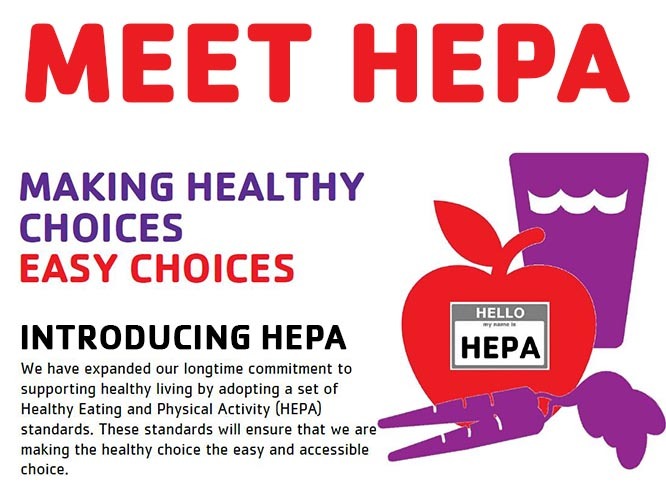 To learn more about HEPA and see where you can get involved contact the Y today!